MURFREESBORO. Tenn. (ALEXIS MARSHALL) -- It’s hard to imagine mid-state Christians and Muslims doing much of anything together, given the number of religious bias incidents being reported to police in recent months, and the heated rhetoric on social media. But on a recent Sunday afternoon the group Murfreesboro Muslim Youth hosted hundreds of visitors at their sixth Love Your Neighbor potluck in a Rutherford County park. "I wanted to be part of this community event,” Griffin said. “And I wanted to show them (her grandkids) what community is all about." Griffin said she thinks that with all the divisive rhetoric in politics and the media, it’s easy to forget what it means to love your neighbor. In fact only a month ago, the Islamic Center of Murfreesboro was vandalized with spray painted expletives and bacon, which is forbidden for practicing Muslims. Anas Hajhussein is a board member for Murfreesboro Muslim Youth. He points out that his organization is separate from the Islamic Center, but goes on to say he believes that the vandalism there was committed by a few individuals and does not reflect the views of the whole community. Still, he says that the Love Your Neighbor event offers a welcome escape from the problems mid-state Muslims are dealing with. “It just makes you forget about everything that's happened, you know, and just sort of live in the moment and have fun,” he said. The next Love Your Neighbor potluck is scheduled for October 22. 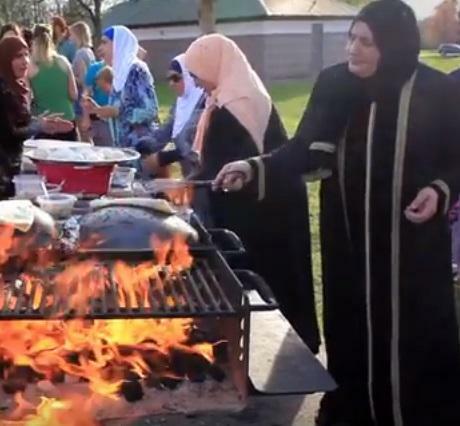 Would you like watch a video produced by Murfreesboro Muslim Youth about their potluck?